Hurt in a Traffic Accident? Traffic accidents happen regularly, and they often result in significant damage and injuries. In most states, the person at fault for a traffic accident is the one found negligent, and that person or the insurance company (who is not a party to the lawsuit, typically, but has a third-party contract with the driver) is responsible for the medical bills, vehicle repairs and victims’ damages. However, the determining who is responsible is not always simple, and disputes can arise about who was at fault for a crash. When victims of auto accidents do not receive the compensation they need, personal injury lawyers can help. Injury lawyers know how to investigate car accidents and talk to the at-fault driver’s insurance company in order to get victims compensation. They can help you figure out what to do after a car accident. When is a Driver Negligent? Inattentiveness – If a driver is in a hurry or simply forgets to observe the road fully, a serious traffic accident can result. Disobeying a traffic law – Many traffic laws are in place to make the road safe. When a driver travels at an unsafe speed, tailgates another vehicle or attempts another type of illegal maneuver, that driver acts in violation of the law and is liable for damages. Driving while distracted – Though cell phone use in a vehicle is not illegal in every state, it still counts as a distraction and anyone using a handheld phone at the time of an accident is negligent. Other distractions include eating, drinking, applying makeup or anything that takes a driver’s focus away from the road. Driving under the influence of alcohol or drugs – Driving while intoxicated is one of the most serious offenses a driver can commit. Drunk drivers often cause fatal accidents, which can result in both criminal and civil liability. How Can a Lawyer Find Out Who is at Fault for a Traffic Accident? Police reports – Police officers can greatly support a victim’s case. A police report specifies the details of the crash based on the information the officers can acquire at the scene. 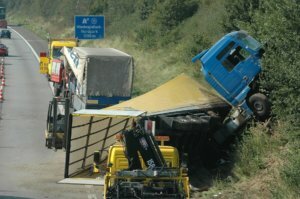 Injuries and Damages – The physical effects of the accident on the vehicles, people and environment can provide significant details about the cause of the wreck. Expert Investigators – Professional car and truck accident investigators can use available evidence to reconstruct the scene of the accident in order to determine what occurred. Many personal injury lawyers deal with traffic wreck liability. If you have a dispute about how much compensation you should receive from an insurance company or other driver following a car accident, having a lawyer on your side is imperative. A lawyer can negotiate a settlement or take a case to court if necessary to seek compensation on your behalf.